Gudi Padwa is a festival that marks the greetings in New Year based on the Hindu calendar and is celebrated on the first day of Chaitra month. It is an apt time for new beginnings or to start doing things differently. There are many things you can do on this auspicious occasion and Yoovite.com has an online invitation tool by which you can invite your friends and relatives to come over to your place for the New Year greetings. Gudi Padwa is an occasion where you ought to decorate your home in style and tradition to signify the new beginning. Putting up diyas, candles, flowers, torans, string lights and rangoli are some of the quick decoration ideas that you can implement for your house. Potted plants placed on window ledges, coffee tables, kitchen cabinets etc. are another interesting option for decoration. If the walls lack brightness, then you should repaint them before the festival. The furniture and curtains must also be cleaned, painted or replaced. You can use conventional and unconventional bells and wind chime along with the diyas is also a good idea. The Maharashtrian tradition is to prepare a Gudi and hoist it in the doorstep. This activity is followed by various rituals. You can take part in merry making with your friends and relatives through various activities such as singing, dancing, playing cricket etc. The options are endless. You can have conventional vegetarian food depending on the state in which you live. 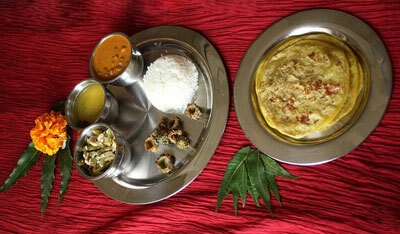 In addition there are certain specialty Gudi Padwa recipes which you can try. You can prepare a delicious Almond Roll for your guests. Bata Vada is a special type of vada indigenous to Maharashtra. It is made by dipping potato in besan. Bean Cakes, Boortsog, Chocolate Risotto, Dry Fruit Chikki, Fried Brown Rice, Greek Halva, Imam Baildi etc. are other great dishes and sweets that you can prepare for your friends and relateives. Flowers are suitable for every occasion and Gudi Padwa is no exception. You can send your loved ones a bouquet on the occasion through online flower delivery services. Ornaments and decorations are another way to convey your care to your friends and relatives. You can give wall hangings and flower vases and other handicraft decorative in addition to ornaments. Everyone loves chocolates and you can surprise people with expensive foreign chocolates. Sweets and savories form part of the gift ideas along with chocolates. If you can prepare the sweets at home, then it is even better. You can gift door hanging or Bandhanwar to your friends and relatives as part of their home decoration. They can use it to decorate the entrance of their home to make them look more traditional. These days, giving electronic gifts such as iPod, iPad, Kindle etc. are also acceptable. These type of gifts are very popular among youngsters and you can win their heart by stuff like these. Video game DVDs, PlayStation, Xbox etc. are also great gifts that you can give to young people.